In a step that reflects the growing importance of the Ethiopian market for its investments, Julphar, the leading UAE global pharmaceutical company, sponsored the inaugural of Ethiopia Healthcare Summit, which kicked off this week in the Addis Abeba, in presence of over 200 industry experts and investors. “Julphar’s support for the Healthcare Summit comes at a time where the UAE and Ethiopia are strengthening their trading ties. It also follows the visit of an Ethiopian trade mission last month to the Dubai Chamber of Commerce and Industry, to seek stronger bilateral ties with the emirate”, a statement from Julphar said. Last year Julphar has established its first manufacturing plant outside the UAE, in Addis Ababa, jointly with Medtech, their local partner. Julphar Pharmaceuticals PLC is now offering a “comprehensive portfolio of high quality, affordable pharmaceutical products which are distributed in Ethiopia”, according to the company, with expansion plans for additional capacity and exports. The plant is currently producing tablets and syrups and employs 130 local staff. “Our investments in Ethiopia and Africa will help local governments achieve their Millennial Development Goals – particularly in relation to combating disease, by optimizing availability of and accessibility to quality medications, and reducing African markets’ reliance on imported medicines. They also support the African Union Commission’s (AUC) Pharmaceutical Manufacturing Plan for Africa (PMPA), endorsed by the heads of African states”, said Steve Gravenor, Director of the Sub-Saharan Africa region at Julphar, in his speech during the Summit. “Julphar is looking to explore partnerships with African governments, regulatory bodies, NGO’s, finance institutions and healthcare providers in order to expand our investment footprint across the Continent, contribute to the rapid development of Africa’s indigenous pharmaceutical sector and improve healthcare inclusion of local communities”, elaborated Gravenor. Last month, Julphar took part in the annual Ethiopian Pharmaceuticals Association (EPA) conference, where Julphar arranged two weeks hands-on training in the UAE for five academically meritorious graduate students from five Ethiopian universities through EPA. “We are delighted that our support will enable students to benefit from the internship program. We are convinced that the provision of accessible healthcare will remain a vital foundation of the economy of Ethiopia and we would like to express our commitment to working in alignment with our partners to contribute towards sustainable healthcare in the region.” said Mukamil Abdallah, Country Director, Julphar Pharmaceutical PLC. Julphar was launched in 1980 as a generic pharmaceutical company. In 2012, the company made inroads into biotechnology with the launch of a $150m manufacturing facility in the UAE, entirely dedicated to producing the raw material needed for biosimilar products. Today, this facility is the only plant in the MEA region that produces insulin using insulin crystals derived from r-DNA technology. “As a global pharmaceutical company with proven knowledge and expertise, Julphar will focus its investments in Africa more on local manufacturing of much needed treatments, which would enhance the quality of healthcare services provided by African governments for their citizens, and create more job opportunities for local talents”, further explained Gravenor. 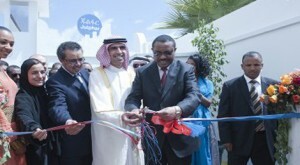 Caption: Julphar’s manufacturing plant in Ethiopia was attended by: from L to R: Sheikha Lubna Al Qasimi, UAE Minister of Foreign Trade, Dr Tedros Adhanom, Ethiopia Foreign Affairs Minister, Sheikh Faisal Bin Saqr Al Qasimi, Chairman of Julphar, and Hailemariam Desalegn, Prime Minister of Ethiopia.